Julia Modise is a consultant in Spencer Stuart’s Industrial and Human Resources practices, based in Johannesburg. Julia is a seasoned human resources leader, with extensive experience in the global industrial sector and in the South African retail, property, media and entertainment sectors. Before joining Spencer Stuart, Julia was the general manager of human resources for Multichoice South Africa, a leading video entertainment and internet company (part of the Naspers Group), based in Johannesburg. 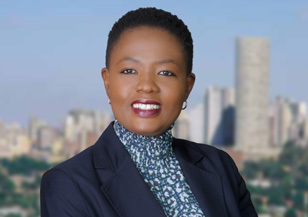 Prior to Multichoice, Julia served as the executive head of human resources with Growthpoint Properties in Johannesburg, South Africa’s largest property investment holding company. She was the group human resources director for Sub-Saharan Africa with Goodyear Tyre & Rubber Holdings, based in Port Elizabeth, South Africa. Earlier, Julia spent eight years with Cummins, culminating as human resources director for Africa. Julia spent several years in South Africa with Cummins, as well as two years in Indiana at the company’s headquarters, serving as the leader of global HR operational excellence manager for the distribution business. Julia earned her bachelor’s degree in management from Indiana Wesleyan University, and a post-graduate diploma in leadership from Stellenbosch University in Cape Town. In addition, she earned a human resources diploma from the Institute of People Management South Africa. She speaks English, Sesotho, isiZulu and limited Afrikaans. Originally published in HR Future magazine, this article explores the 11 capabilities that have become more important for CHROs as they’ve become key players on the executive team.